Hey pretty mum-to-be! Many congratulations to you. Be it your first time or second or third, the excitement is still surely unmatched. The Halloween celebrations will be all the more special with you carrying your little one. Don't make this Halloween any less fun because of your adorable baby bump, rather let's celebrate it a fun way. PartyBell is making things a lot more simpler to choose your Halloween costume. Maternity halloween costumes for the first two trimesters are not so difficult to pick. Since the baby bump is not as comparatively prominent as in the last trimester, you can choose any you like from PartyBell's page here. Here we are going to cater to our gorgeous moms-to-be who are in their last trimester for whom options are rather few. But, at PartyBell, you will find plenty of options for you to delve in the fervour of Halloween. Now that your baby is growing fast, your belly bump is at its cutest. We have equally cute and charming picks for you. For the angel you are and the little angel within you, we have this fairy costume in charming pink. The size is available upto 12, i.e. bust size to be upto 38" and waist, 30". For the third trimester, this costume will fit you good if your size on bust is upto 49" and on waist, it's upto 39". The fabric is too delicate and fringes flowing down the knees add superlative charm to the costume. Don't forget the carry the cigarette holder and the gloves to nail the look. No less than a goddess you are at this time. It's just a matter of some weeks now, you will have your baby in your arms. 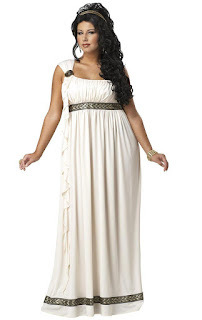 Feel the royalty and immaculacy as you don this Atlantis Goddess costume. The pleasing color combination rimmed in golden around the neck and waist with an equally delightful headpiece is going to make you stand out of the crowd. Leave everyone bewitched as you play your magical spells on them. 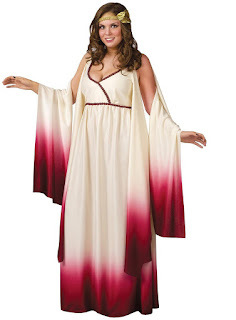 The costume is available in two sizes 18-20 and 22-24. Don this costume that comes with the conical witch hat and enjoy your Halloween. Nothing looks more elegant and pristine than an Olympian Goddess. This costume is available in two sizes (16-18 and 18-20) and comes with the lovely gown, headgear and medallion. Don't forget to pair it with these gorgeous ear-rings. Be the Goddess of love, in this strikingly beautiful gown in vibrant color combination. 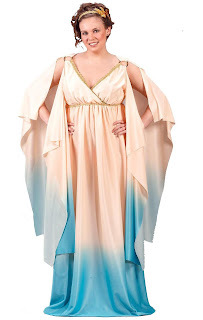 The flowing arms add a celestial charm to this gown. The headpiece is inclusive of the costume. Don't feel yourself any incapable of partying and rocking in the most glamorous costumes this Halloween. PartyBell is going to make sure EACH and EVERYONE has a gala time this Halloween. Still want to look for more options? 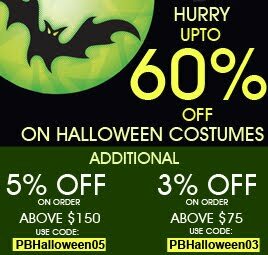 Dig in the PartyBell's dedicated page for halloween costumes for pregnant women.